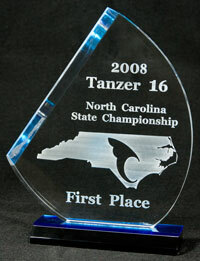 These are heavy acrylic standing trophies with a colored base that reflects up through the top. We engrave them on the back side, giving the image a look of great depth and clarity. They come in two sizes, 6x7.5 and 7.5x9. The bases come in blue and gold.